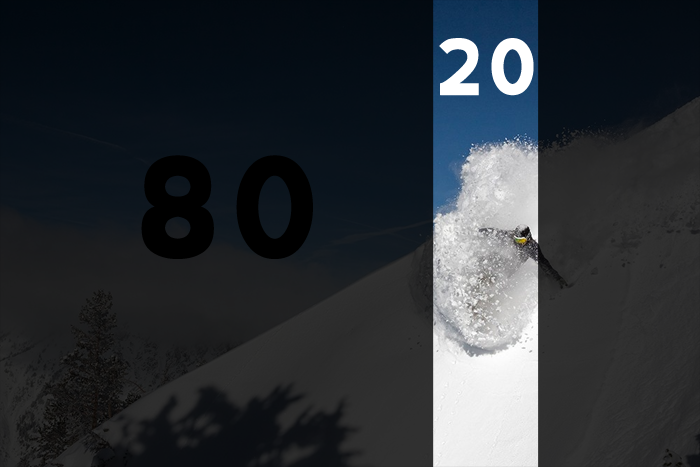 By Leslie Juvin-Acker When it comes to effort, the Pareto Principle says that there is an 80/20 rule: 20% of effort creates 80% of success. And, when it comes to job hunting, there are two types of effort that are communicated throughout the process: 1) The kind of effort that demonstrates physical and mental focus and 2) Effort as a result of the work done. Take a moment to observe your own schedule and analyze what you’re doing with your time. If you’re an entrepreneur like me, you’re probably spending 80% of your time doing backend work and 20% face-to-face with clients - and yet, admittedly, it’s the 20% of my work that gives the rest of the work I do purpose and that 20% of my time is what defines my brand and what makes me unique. It’s easy to look at the effort we put into our job search as a waste of time when rejection is a reality the majority of the time. This paradigm alone is enough to discourage us from making and achieving efforts that will differentiate us - put our true selves out there, so to speak. When it comes to the job search, how can we measure and know for sure what effort creates the most long term value? I think of effort as the Goldilocks Effect. Based upon the old fairy tale, too little effort and we won’t have enough fuel to get us where we need to go. Too much and we get scattered and burn ourselves out. Just enough - now that’s where the “luck” happens. When job searching, there is a tendency to get caught up in the fear of missing out. “FOMO”, as the kids call it, drives us to shoot at everything with a shotgun approach. Any whiff of opportunity and kablam! Just throw ourselves at any and everything and hope there is a result from our efforts. “Nobody can say I didn’t try…”, I’ve been told time and time again. I’ve seen this a lot at Shmooz events and with my own clients. I’ve been approached with hundreds of resumes chock full of experiences and yet, no actionable focus. There is a hope that I’ll understand their past for them (this hope then is transferred to the HR professionals who receive their resumes). Our efforts and consequently our resumes must answer the following questions: Who am I? What am I doing? What was all of this experience for? What do I want to do with it? These questions examine our efforts and put them into perspective so that new opportunities may be inspired from them. Without a sense of understanding as to why we’re spinning our wheels, all of that effort goes in vain and is ultimately ignored (think the proverbial File 13). When presenting yourself on the job search going back to the two types of effort as a calibration of the 80/20 rule can help. 1. What did I gain/learn/take-away from my efforts? 2. How much time and what kind of effort did I commit to those results? 3. What clear story or message do the two aforementioned answers communicate? We do a lot each day at work and while everything adds up, a surprisingly small percent of that effort makes a big difference. Our job and responsibility is to know and understand that effort - it’s not anybody else's job. And when we know that, it becomes easier to get the job that allows us to do more of that good stuff that makes our careers just right. 1. How much mental/physical effort do I put into my job search? Not enough (weak resume and online profile), too much (overloaded with everything we’ve ever done), or just right (highlighting that work that defines our success)? 2. Does my online profile/resume answer the following questions: Who am I? How did my efforts achieve results? How did that effort define my “brand”? 3. When looking at the proportion of rejection and acceptance in my career thus far, how did the rejection help me to focus my efforts and how did the acceptance help me do more of what I love to do? 4. What activities (at work and on the job search) do I do that provide the most value to others? What does that tell me about how I spend my time? 5. Does my profile demonstrate a concentrated effort or am I scattered? Given the results of my efforts, how can I build upon those things that provide the most value?